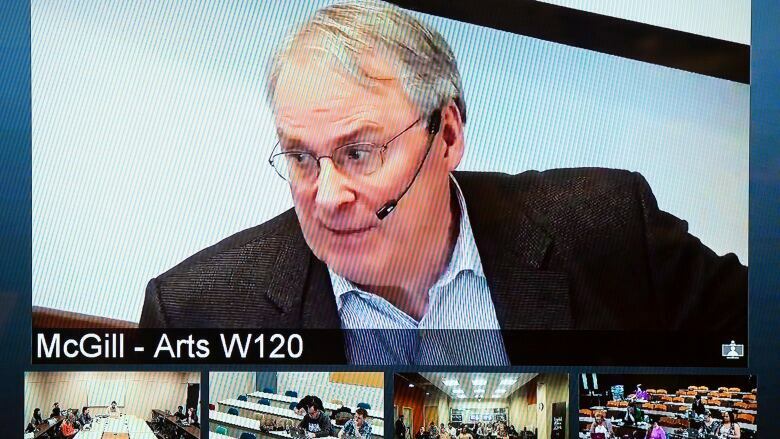 Ken Dryden sits in a classroom at McGill University in Montreal ready to talk to students about the future. His face beams into four other classrooms across the country — namely in St. John's, Toronto, Saskataoon and Calgary. Ken Dryden sits in a classroom at McGill University in Montreal ready to talk to students about the future. His face beams into four other classrooms across the country. "Ryerson, can you hear me?" he asks. Students at the Toronto-based university give the large-screen television with Dryden's face the thumbs up. The former politician and hockey player checks in on three other schools: the University of Calgary, the University of Saskatchewan and Memorial University in St. John's, N.L. 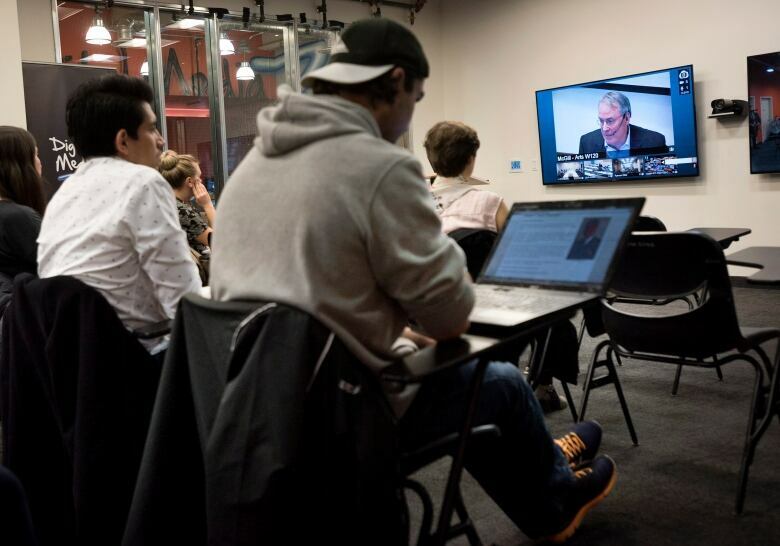 About a dozen students in each location are all on the video conference, as they are every Thursday this semester. The idea is simple: connect a bunch of remote classes simultaneously, but make it feel like one big classroom. At Ryerson, voice-activated cameras hang from the back and front of the room. Dryden and video of the four other universities show up on two big televisions. His voice booms in from the ceiling speakers. The whole thing is very metaphysical — the topic of the course in the futuristic classroom is called "Making the Future," which discusses events that haven't happened yet. "The idea was for students to not only think about their own futures, but how they would live in Canada and how they would live in the world around them," Dryden says in an interview with The Canadian Press before the class last Thursday. But it is also a way for students to understand the regional differences that exist in Canada on some of the country's most important issues such as health care, fossil fuels and aboriginal affairs. In one class, for example, they discussed the oil industry. Should the country go all-in on oil or abandon it altogether? The answers differed markedly depending on the university. Dryden says the students in Calgary are much bigger supporters of the oil industry compared to those at Ryerson or McGill. Then they conducted an online poll to figure out how many students had relatives that worked in the oil industry. The results, tabulated instantly, showed nearly 75 per cent of the students in Calgary had a relative working in the oil industry. Not surprisingly, the results were significantly different at the other universities. Sometimes those differences galvanized students. "We also became a tight-knit group here especially if one of the other schools had such a wildly different experience with something. It would force us as a group at Ryerson to talk even more about why those differences exist," says Anisa Hassan, 23. Dryden drives home these differences by having students from different universities work on assignments together — a cross pollination of sorts. They have to co-ordinate schedules, taking into account time differences. Hassan's new friend, Emily Gagne at McGill, says the class "gets us out of our bubble." "A lot of time conversations in classes come from the same perspective and this challenges our conventional thinking." The classroom of the future isn't perfect. Dryden knows it. The students know it. Sometimes the connection isn't great. Sometimes the audio and video do not line up. And the natural flow of a classroom discussion is stilted because of the technology. "We would have to unmute our feed to say something to Ken, who would then line us up to respond," says Lucas Duffield, 27, from the University of Calgary. "It can be difficult at times to get your point across right away when there are five universities." And the classroom of the future is filled with students from the present. Some pay attention while others check Facebook. One Ryerson student struggles to stay awake — Dryden has been speaking for more than an hour, seemingly without taking a breath. Dryden has long thought about teaching a course like this. He began preparing in earnest after losing his federal seat in parliament in the 2011 election. A few months later, he started teaching the course at McGill. For two years, it was only offered there. He has a vision to connect students in universities from all provinces by 2017 — the year Canada turns 150. The University of Calgary joined last year and this year Ryerson, Saskatchewan and Memorial universities came on board. "This is what I had in mind," he says, "which doesn't happen very often." He wants students to think seriously about the future. His first assignment to the class: write a one-page narrative of one day in your life 10 years from now. The answers are enlightening, he says, and cuts to the core of their hopes and beliefs. When asked what one day 10 years from now holds for Dryden, he says "I hope I'm doing something interesting that has some purpose, some excitement." He continues for another five minutes, speaking in broad terms. "If that was the paper that I had written and submitted, I'm not sure I'd be very impressed with it," Dryden says, laughing. He's not too worried about his future.